A member from an ECOSOC-accredited NGO has been banned from the United Nations building after he was caught spying on participants from other NGOs. In the past activists have denounced several times the intimidation they were facing during UN human rights sessions, either from State-sponsored NGOs or from the States themselves. The United Nations has barred a Chinese man from attending a Human Rights Council session in Geneva after he photographed at close range a woman who gave testimony about her father who is serving a life sentence in China for his political activities. The United Nations said the photography was “intimidation” and the man was forced to delete the images. The incident drew attention to an open secret that is nevertheless rarely so clearly demonstrated — that some Chinese groups listed as nongovernmental organizations are in fact actively working to promote the Communist government’s political goals and may spy on people that Beijing considers hostile to its interests. “His pass was due to expire anyway on Friday, but nevertheless he’s not allowed to come back in the building. Full stop,” Mr. Gómez said. The organization to which he belongs has not been barred from the council, however, Mr. Gómez added. That organization, the China Association for Preservation and Development of Tibetan Culture, was registered at the council meeting as a nongovernmental organization. According to its website, its senior leaders include Du Qinglin, a member of the Communist Party’s Central Committee and the former head of the United Front Work Department; Zhang Yijiong, a Central Committee member and former deputy party secretary of Tibet; and Zhu Weiqun, a former deputy head of the United Front Work Department. The United Front Work Department is under the Communist Party’s Central Committee and is charged with forming alliances with groups or individuals in China and abroad that the party believes are friendly to it. The headquarters of the China Association for Preservation and Development of Tibetan Culture are in a heavily guarded government building in Beijing. Its address, 135 Fuyou Street, places it next to the United Front headquarters and across the street from the Zhongnanhai compound, where China’s leaders live and work. It is one of the most heavily guarded streets in the capital. After trying to contact the association by telephone and email since last Thursday, a reporter tried to visit on Monday but was stopped from entering by a man dressed in black, with an earpiece. Behind him stood a soldier. The main building was a large, neo-Classical style structure with flanking buildings, all in white stone, behind a high fence. The reporter was directed to a gatehouse, where she was met by a representative of the association who gave his name only as Mr. Xiong. He photographed her press card and business card with his smartphone but declined to answer any questions about the incident in Geneva, saying he was not aware of it. Asked if he was Tibetan, as might fit the association’s mission, Mr. Xiong said, “No, I’m Chinese.” He added that people often take him for Tibetan “because I’m so black,” using a Chinese word for dark-skinned. He then left, saying he would pass an interview request on to his superiors. 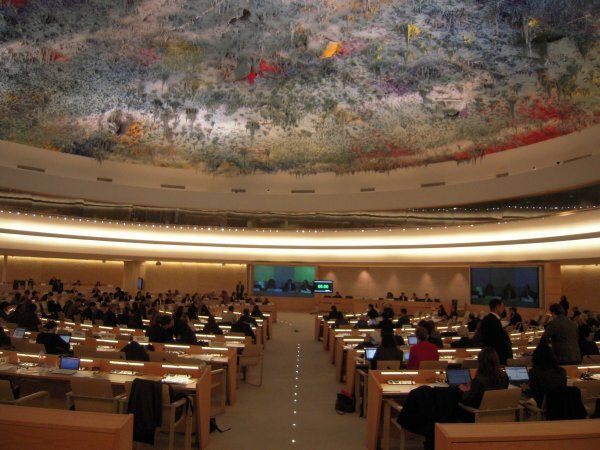 Mr. Gómez, the United Nations spokesman, declined to name the man who was barred from the Human Rights Council. The man had been photographing Ti-Anna Wang, 24, who testified about her father, Wang Bingzhang, who was kidnapped from Vietnam in 2002 and sentenced to life in prison after trying to set up an opposition political party in China. Ms. Wang spoke at the invitation of U.N. Watch, a Geneva-based nongovernmental organization. The meeting was to consider a human rights report produced by the United Nations, known as the universal periodic review. The report was adopted last Thursday, one day later than expected, after delays largely caused by calls from Western nongovernmental organizations for a minute’s silence to remember a Chinese rights advocate, Cao Shunli, who died in custody on March 14. U.N. Watch has appealed to the president of the Human Rights Council, Baudelaire Ndong Ella, to remove the Chinese association’s credentials as a nongovernmental organization and to file a formal complaint about the man’s behavior with the secretary general of the United Nations, Ban Ki-moon. It is unusual for the United Nations to comment publicly about such an incident, which could be embarrassing for China, which was elected in November to the Human Rights Council, where it is supposed to uphold the highest standards of human rights. The man had first openly photographed her and her laptop screen. Then, after being asked by a United Nations employee to stop — such photography violates regulations — he continued to photograph her surreptitiously, with a camera device partially hidden behind his jacket. But he was observed again, removed by security and forced to delete the images. Ms. Wang, who saw him at close quarters, posted on Twitter what she said was an image of the man, taken from the United Nations’ television broadcast of the council hearings. She said she did not know his name.